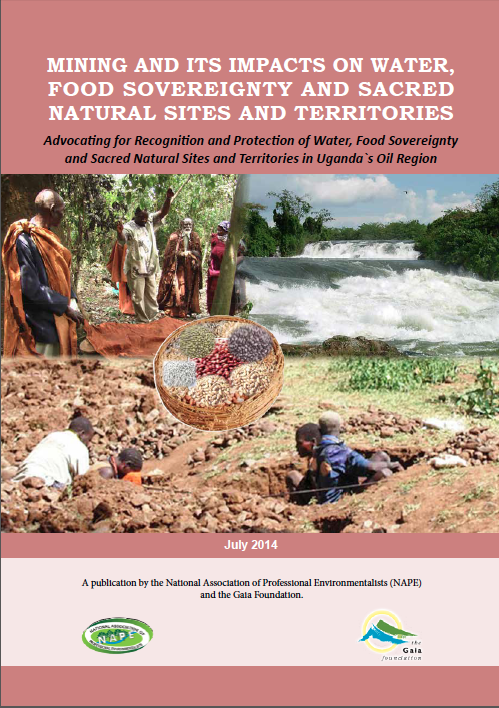 The National Association of Professional Environmentalists (NAPE), Uganda and The Gaia Foundation (UK), have published a new report entitled "Mining and its Impacts on Water, Food Sovereignty, and Sacred Natural Sites and Territories". Focusing on Uganda’s Bunyoro region, the report reveals how mining is significantly threatening ecosystems and communities. It advocates for the recognition and protection of watersheds, food sovereignty areas, and Sacred Natural Sites and Territories as No Go Areas for mining and extractive activities. Mining and extractive activities are growing rapidly in Uganda and across Africa. The Ministry of Energy and Mineral Development in Uganda estimates there are 3.5 billion barrels of oil and gas deposits in Uganda’s Albertine region alone. The impacts of mining are of grave concern to communities and civil society organisations across Uganda and beyond. The report warns that oil extraction, which is projected to begin in Uganda by 2017, would have destructive, widespread and long-term impacts on the Bunyoro region, which is celebrated for its rich biodiversity and cultural heritage. The region’s abundance of water, food growing areas and Sacred Natural Sites and Territories, upon which surrounding ecosystems and the lives and livelihoods of communities depend, are at great risk. Women are likely to be disproportionately affected by mining given their dependence on these ecosystems and the vital role they play in their protection. As ecosystems are interconnected, the impacts of mining would threaten not only Uganda but also the Democratic Republic of Congo, Rwanda and Sudan- which share a common watershed - with untold political implications. The report emphasises the important role of communities, civil society and government in preventing and reducing the impacts of mining on water, food sovereignty and Sacred Natural Sites and Territories. It cites relevant laws and policies, which could be used to assert a right and responsibility to say ‘No’ to mining. It also calls for recognition of, and compliance with, unwritten law – the laws of the Earth (Earth Law) which are reflected in communities’ customary governance systems - as central in the protection of Nature from the threat of mining and extractive activities. The report is published with support from the African Biodiversity Network, and Advocates for International Development.